Many businesses are facing a new threat to how they’ve traditionally positioned and delivered value for customers. This applies in particular to service businesses, where companies have tended to rely on providing access to data and information. Take the investment business as a case in point (this applies to most other service businesses however). In the past, when people wanted to invest and grow their money, they had to go through a stockbroker or some other intermediary. When they wanted to make a transaction or decide on whether to keep a stock or sell, they were almost completely reliant on the intermediary to provide up-to-date pricing data. Newspapers published daily closing prices on stocks, bonds, commodities and currencies, but that was about it. Then along came the Internet and the amount of data and information went through the roof. In parallel with this came an explosion in knowledge and information that was available to the average investor about how to invest for growth, retirement, or just plain security. Nowadays, investors are much more sophisticated about tax deferment and other investment strategies. Just browsing through the business and finance section of any bookstore gives an idea of the amount of information and knowledge available at minimal cost. All this has had the effect of undermining the traditional value proposition for investment advisors. Before, people had to go through them to get basic data and information and also to actually make their transactions. Internet brokers and access to a galaxy of information online has given a lot more power to individual investors. This has undermined the information-knowledge hierarchy that gave the strong position to investment advisors. The concept of information or knowledge hierarchy is a product of information technology and information science. The most basic form of information is data. These are simple figures or symbols that represent any “differences that make a difference” (to quote information theorist Gregory Bateson). A stock price quote is an example of a datum. A car’s speed as indicated on its speedometer is also another type of datum. However, data such as these must be put in context to make them understandable and relevant. A car’s speed doesn’t tell us much unless it’s transformed by contextual information, such as the speed limit, the driver’s habits, and whether the speed is dangerous or prudent given the road conditions. The same applies to a stock price. Out of context, it’s fairly meaningless. But in context, such as whether it represents a price rise or drop, whether the overall trend is up or down, and what other stocks are doing in similar conditions, all of this information provides the necessary context to understand the value and import of the data. The two bottom runs of the information ladder are therefore composed of basic data and interpretive information to set it in context. The next level up is knowledge. This is where the data and information are given wider meaning in the more abstract framework of a system. Speed data and speed limits are part of the wider system of driving techniques. With proper knowledge and expertise, drivers know when to speed up, when to slow down, where to go, how to get there, etc. Investment pricing data and contextual information are part of a general investment and wealth management system. If an investor is trying to protect her wealth, then the system must be oriented to security and value investing rather than growth. I’m simplifying obviously, but I’m just trying to show how knowledge uses data and information to make decisions and orient action. The final level in the information is wisdom. This is the ability to make general decisions while considering multiple concrete factors. For instance, wisdom tells us that adolescents below 16 or 17 shouldn’t be allowed to drive, as they tend to lack the judgment and prudence to drive safely (notwithstanding the fact that many adults don’t drive safely). Wisdom is also involved in the decision to take a driver’s license away from someone who has poor vision and slow reflexes, such as the very elderly, or people who drive intoxicated. In the financial realm, wisdom will enable a person to make investment decisions in line with their life course, their objectives, and their personality, risk temperament, and overall political and economic conditions. In other words, wisdom sits on top of the information hierarchy, because it provides the overarching framework for all decisions and actions. So if a company is facing increasing commoditization of its products and services, this forces it to adopt a cost-leadership strategy. This is much more precarious than a company that bases its value on differentiation and quality. If you’re faced with this situation, you can try to compete defensively by reducing prices and/or increasing volume, but in the long run this will only continue to erode your relative value. 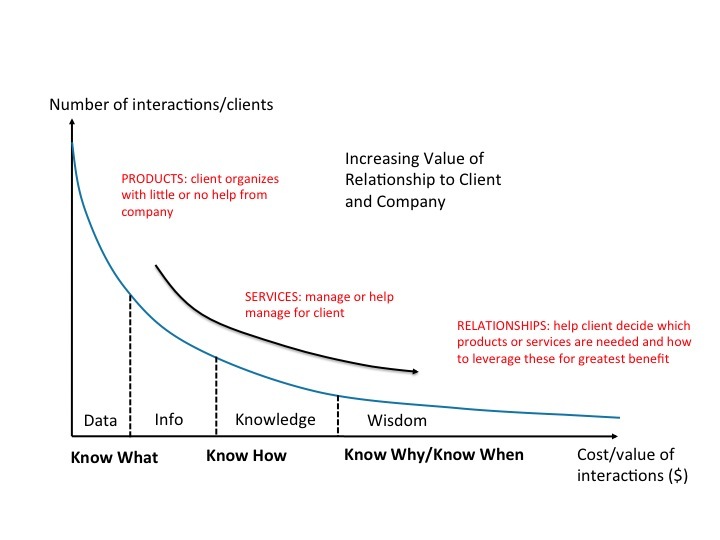 The preferred strategy should be to move to the right, into the area of knowledge, i.e., providing know how, or even better, into know why and know when, i.e., close relationships based on wisdom and personalized services. © Alcera Consulting Inc. 2014. We encourage the sharing of this information and forwarding of this email with attribution. All other rights reserved.